Salvo: Can you explain, in brief, how the current conflict between UTLA and LAUSD emerged? Claire: Today's battle over education has been years in the making. It is a microcosm of the national struggle to defend public education from privatization and re-segregation. It's also the latest battleline in national efforts to bust teachers' unions, cut benefits, and casualize our labor. Here in Los Angeles, one could trace this fight all the way back to the severe budget cuts to education and public services during the recession of 2008. Since then, teachers have sought to use every contract battle to win back funding of our schools, and to rebuild the programs that were gutted in those years. At the same time, the political and business elite of Los Angeles have entrenched themselves behind a different and incompatible vision for education's future - one where public schools are phased out and replaced with privately-run non-union charter schools, many with ties to the software corporations that profit from the overtesting of our kids. These charter schools in most cases replace the shared governance structure of public schools with a corporate structure and a lack of transparency. In the last year, the Los Angeles Board of Education has become a bastion of this thinking, with proposals to break up the school district, and the attitude that they don't need to fix public education because charter schools will soon replace it. So we find ourselves twenty months into negotiations on our contract with a district who essentially refuses to touch any of the more than thirty demands we've put forward regarding improving our students learning conditions, a district who squirrels away public funding by the billions in reserve accounts while declaring financial crisis and calling for cuts. For teachers and students, the writing it on the walls - either we fight now or we risk losing public education entirely. Salvo: How long have you been a teacher? What drew you to the profession? Claire: I'm in my sixth year as a teacher. Teaching here in LAUSD has been my dream profession since I was fourteen, and was myself a student in LAUSD. I was a struggling student in a school where race, class, and immigration status largely determined access to advanced coursework. I went into teaching high school to be part of raising kids capable of making our city and our world a better place. Additionally, I wanted to be part of the movement that would protect public education as a right for the future, and would transform the role of public schools so that they truly served all our students equitably. Salvo: Can you talk about the conditions you've faced in the classroom? Are these unique to your own situation? Claire: Since I started teaching, I've increasingly found our schools unprepared to cope with the social trauma our students are living - worsening inequality, houselessness, and poverty, and the precarious conditions many of our immigrant families are surviving in. As teachers, we are stretched thin trying to fill the gaps, with little to no support from the district. I personally spend thousands of dollars of my own money annually to buy school supplies, books, and art materials for my classroom and for the students who can't afford their own. I've paid out of pocket for translations of class materials to Spanish and Korean to meet the needs of my English Language Learners when district translators were too overworked to get translations done on time. I have to play so many different roles to support my students - counselor, activist, tutor, interpreter, advocate - but every year we're doing more work as teachers with less support. 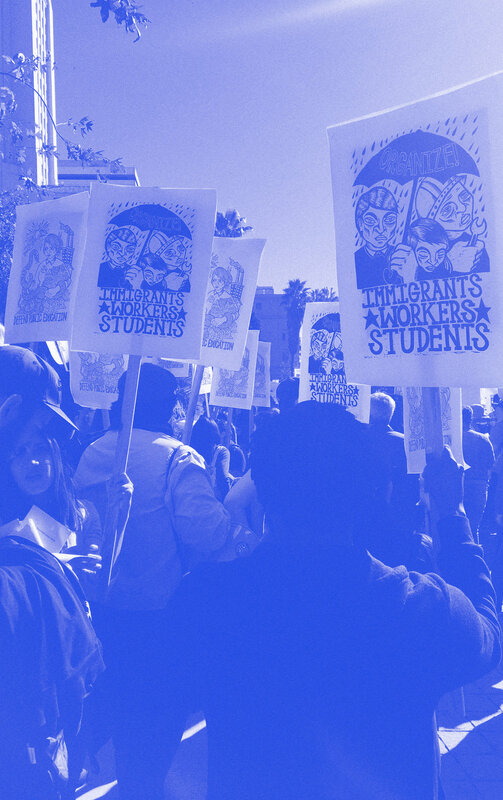 I have taught myself about immigration, housing, and labor rights to be able to support my students and their families with economic and social crises they face, and spend a lot of my out of the classroom time helping connect families to resources. I regularly work ten to fourteen hour days as a teacher, only to have to spend weekends and evenings organizing to hold onto the tiny gains we've made in education funding or to protect our benefits and working conditions. Every year feels like a fight. Meanwhile, my classroom numbers keep rising. When I started teaching, my largest class was 32. Now my classes are almost always at around 36 - well above 200 students in total - with new students arriving all year long. This year, my school did not even have enough classrooms for all the teachers, so I became a traveling teacher - carting my whole classroom around on a cart I bought myself. It's not just an inconvenience - my classroom is never the way I left it, and with so many kids packed in it's easy for a chair or cord to get moved to an unsafe position. That's how I fell and broke my shoulder in my classroom earlier this year. Salvo: During your time as a teacher, have you seen the character of the work change at all? What about the broader profession? Claire: Yes - there is a neoliberal push coming down from both the Democrats and Republican political elites to casualize and deskill teaching, while increasingly substituting technology for teacher expertise. By casualize teaching, I mean turn teaching into a profession that requires less training and less knowledge, so that teachers are more easily replaceable. At the same time, we see teachers, through our unions and through grassroots teacher organizations, increasingly leading the fight for improvements to educational quality. Teachers are more united than ever before behind a progressive and just vision for democratic, innovative, culturally-responsive schools. Things like restorative justice practices in place of punitive ones, bilingual education, ethnic studies, quality early childhood education, interdisciplinary and project-based learning, community-based research are all ideas that came from teachers, not from politicians. Salvo: As a rank and file teacher, do you believe that the slate of demands being pushed by UTLA is comprehensive? Claire: This is the strongest slate of demands I've ever seen UTLA put forward, and I will be proud to strike for them. Our demands look at what quality education means in a multi-faceted way - how to push back criminalizing policies and support healthy, trauma-informed school communities; how to give teachers the power and support they need to bring innovative curriculum into the classroom and end over testing; how to center students, with all their diverse needs through reducing class size and supporting bilingual education; how to enrich learning with fully-staffed libraries, student centers, parent centers, and extra-curriculars; how to be part of shielding immigrant students from the added trauma of raids and deportations, etc. However, we have faced legalistic challenges to raising these more comprehensive demands in the contract negotiations, as the district argues they are policy issues, not contract issues. This was a foreseeable district objection, and I wish we had a stronger, more creative strategy for how to confront it, however I think what we are fighting for will broaden even more through the strike, as whole communities take a stand and express their own visions and demands alongside ours. UTLA is right to know that our true power lies in mass actions like marches and strikes, not close door negotiations. This just goes to show, though, that we need to see the strike as much bigger than one contract fight, and we need to explicitly shape our strategy to reflect that. It is fight over the state budget, a fight over local education policy, and a referendum on national education policy. In addition, there are many important issues that relate directly to teacher working conditions and compensation that I think we can better flesh out and articulate for the future. These include due process protections for probationary teachers, more gender equitable parental leave policies, and dependent healthcare policies that better reflect the diversity of family structures our teachers have. That said, there is an aspect of UTLA strategy that concerns me - UTLA seems comfortable with accommodating the Democratic Party's desire to stay neutral regarding the strike. At a moment like this, teachers have the power to force political changes, even from politicians who don't agree with us. But that starts with placing demands on those politicians - a lesson we can take from the yellow vest protests in France. Here in Los Angeles, however, UTLA has been very careful to leave our mayor Eric Garcetti out of this, even as he plans to announce a presidential bid. It seems the moment has never been better to hold these politicians accountable to the public education movement's demands. 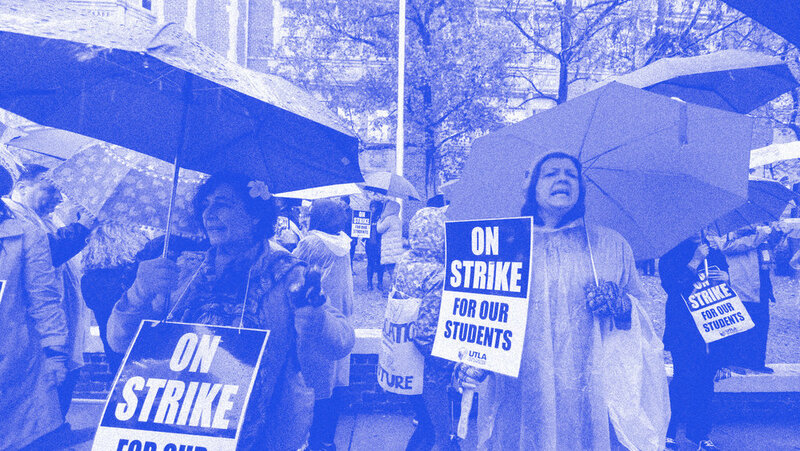 I hope that with this strike, we will be able to take on these politicians directly, and expand what appears at first to be a problem of a few stubborn board of education officials into a more general referendum on the bipartisan neoliberal education policies we've seen pushed by both Republicans and Democrats all across this country. Salvo: Do you have any insight into why the district is willing to risk the first teacher's strike since 1989? Claire: It's hard to know exactly what the district's endgame is, and why they think they have a chance of winning, or even what they really think winning would look like. However, the fact that they hired Austin Beutner, an investment banker and former Los Angeles Times publisher who has no experience in education whatsoever, speaks volumes to their intentions. The experience Beutner brings to the table is dismantling failing businesses, not solving social and educational policies. They only reason to hire someone with Austin Beutner's background is if you've already decided that there is no education policy to be made, and no district to save. In that light, it's no shock that Beutner seems prepared to run public schools, and their teachers, into the ground - that is exactly what he was hired to do. The district is undoubtedly nervous about the strike outcome, and Los Angeles's political elites even more so, but district elites are also very comfortable presenting a vision of a dysfunctional district in chaos to parents and quietly continuing to encourage more and more to move their kids to charters instead. This strike might seem risky given the mass public support teachers' strikes witnessed last year. And while nationally support for teachers' unions is at historic highs, in Los Angeles the campaign to vilify public schools and teachers unions has deep roots and deeper pockets. Austin Beutner holds incredible sway over the Los Angeles Times, and charter-pusher Eli Broad contributes financially to other Los Angeles news outlets. They believe their money and political clout is enough to own the narrative around the strike. In this context, a teachers union fighting for an actual vision to both transform and protect public schools poses a serious threat to them, and to this narrative. They are determined to lock teachers out of any say in the future of education in Los Ángeles. This confrontation is about that. That’s why they refuse to touch any of our demands about student learning conditions, because they will do anything to prevent teachers from being seen as actually being part of positive educational change. Salvo: Did you follow the strike wave that started in West Virginia earlier this year? What lessons do you believe should be drawn from it and applied to the situation in LA? Claire: Definitely they showed us the importance of rank-and-file initiative. That teachers can find enormous power by acting collectively instead of waiting for the Democrats or union bureaucrats to act on their behalf. Also that when teachers and other public sector workers actually step up and raise their own voices through struggle, the overwhelming majority of the public will support them, and they can reverse the right-wing narrative of greedy public sector workers who are stealing our tax dollars. Teachers in West Virginia and elsewhere have learned since their strikes that turning promised gains into actual changes requires continuous organizing, even after the strike is over. No contract or budget agreement is the end-all be-all. Contracts are just pieces of paper - it is the continuing organizing work of teachers, students, and community that will ensure contracts are enforced, that teacher rights and promised improvements to learning conditions are enacted and respected. The organizing structures we've built as UTLA, especially the embryonic rank-and-file self-organization and self-initiative, are a basis to continue the fight when the district will be hoping we demobilize. In addition, while UTLA’s fight is at a city level, the West Virginia teacher strike illustrates the importance of not getting trapped just fighting over the crumbs of municipal budgets when we have the opportunity to target the state and even national budget for education to raise, on a bigger stage the questions of this country’s true priorities. Salvo: What do you think are the broader implications of the UTLA strike for the regional and national labor movement? Claire: The strike is a continuation of the class struggle momentum that has been building over the past year through the teachers strikes across the US and Puerto Rico, the UC workers strike, the hotel workers strike, and all the other workers struggles that happened in 2018 and are still happening. I think that it will mean more workers, in all different kinds of jobs, will feel inspiration that they too can stand up and fight. Especially because teachers are so connected to our communities, the strike has directly touched a huge number of working families across LA. More specifically, I know that there have been moves to connect different teacher unions around California through this struggle. At the same time as LA is preparing to go on strike, Oakland teachers are getting close to striking themselves. And on the 11th, many teachers unions will be doing actions together in solidarity with the LA and Oakland teachers. Those connections are probably going to lead to more statewide organizing around demanding that the state prioritize public education in its budget. After the strike the district is probably going to hold up the fact that most charter schools didn’t go on strike as a selling point to keep promoting their expansion. Saying that non-union charter schools represent stability when compared to the disruption of strikes at unionized schools. To beat that tactic, UTLA will probably put more emphasis on new organizing in charter schools. I think they’ll be pretty successful, because if we win this strike, then we’ll be able to show charter school teachers the power of being in a union, and that will encourage them to organize. After the Chicago teachers’ big strike in 2012, lots of charter schools started unionizing, and now 25% of charter schools in Chicago are organized, compared to about 10% nationally. Salvo is a quarterly print and digital newspaper covering issues in the greater L.A. area from a working class perspective. This article appeared in Salvo’s Winter 2019 print edition.